Switzerland is expensive! But, we can't complain too much about it since we mostly had the kind hospitality of Swiss friends who let us pamp for free, and even fed us many times. We also reduced our expenses by fuelling up with diesel and stocking up on non persishable groceries in Germany. 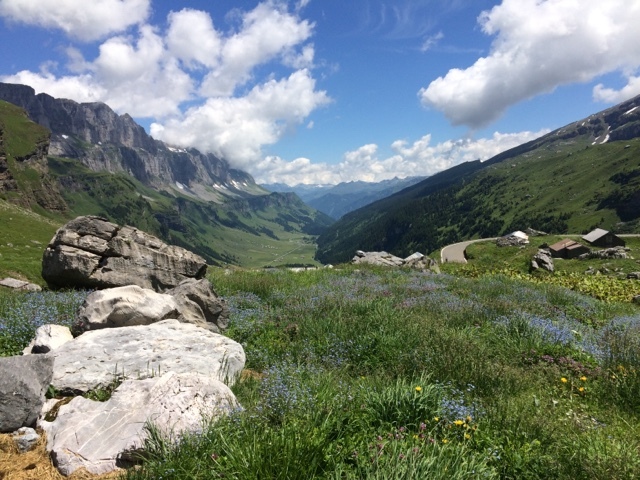 As for free (wild) camping, that can be hard to find in Switzerland but we found that in the mountain passes it was possible whilst also being completely gobsmackingly beautiful. With Swiss friends I've had the pleasure of tasting both Fondue and Raclette (Swiss food), and although all our Swiss friends said they liked Raclette better than Fondue, I definitely liked the super garlicky fondue that I was treated to in a mountain restaurant. For me, I'd heard of fondue prior to visiting Switzerland (that's chunks of bread dipped in a cheese-white wine-garlic-and spices sauce), but I hadn't heard of Raclette (that's cheese , personally spiced and melted under a tabletop grill and served on potatoes.) I guess my liking fondue better than raclette shows that the fondue chef did a better job than I did, since I was personally reasonable for flavouring the Raclette cheese. Switzerland is beautiful, but I think that is no surprise. What was a surprise was the number of expensive and collectors 'leisure vehicles' touring the mountain passes on this first weekend of summer: Porsche, Maserati, Lotus, old classic cars, all styles of motorcycles, buggies, small airplanes, paragliders, if someone thinks it's fun: it's probably crossing the Swiss mountain passes. Oh, and let's not forget: one old 'blac' motorhome that's seen more than those young collectors things probably ever will!